Crest Supreme White Strips are Crest’s strongest whitening strip. If you are looking for fast whitening results then these strips are for you. Please note that Crest Supreme White Strips do not use Advanced Seal Technology for non slip grip so you are not advised to drink water or talk during the treatment as the strips may slide off. Please note that 1 treatment = 2 strips. 20 strips for example = 10 treatments. Crest Supreme White Strips are not available in stores. Your teeth may become sensitive when using Crest Whitestrips Supreme Professional Strength. This is common with products containing peroxide and is not harmful. The sensitivity will go away if you stop using the strips for a few days. Refer to the brochure for more information. * White Fingers – Your finger tips may become temporarily white after applying Crest Whitestrips Supreme. This is common with products containing peroxide and is not harmful. The whiteness can be avoided by washing the gel off your fingers with soap and water after applying the strips. 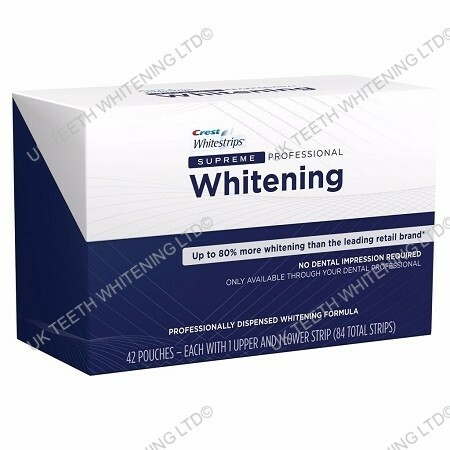 * If You Have Dental Work – Crest Whitestrips Supreme will only whiten natural teeth. The strips will NOT whiten caps, crowns, veneers, fillings or dentures. If you have dental work on the teeth to be treated, consult with your dentist prior to use. Crest Whitestips Supreme has not been observed to harm standard dental restorative materials. You can view our video guides on how to use the Crest Professional White Strips here or view our text guides here.